When I left on the big trip, I’d placed all of my worldly possessions into storage. After all, why pay rent when you’re traveling, right? Funny thing happened while I was gone, though: the amount of stuff locked away in that storage facility grew. At the moment, my life has taken on a strange pattern. During the day, I look for work. In the evening, I go through boxes of old stuff, throwing most of it away or putting it into a box for charity. And in one box I found… brace yourselves… a box of Transformers. As I lifted them out of the box, memories came back. In a twist, though, they weren’t memories of how much I’d played with them as a child. What I remembered was how little I had. Transformers came out in 1984**, when I was about 11 or 12, and I got them mainly because my neighbor Ben had them. He was a year or two younger than I was, and they were his toy of choice for those couple of years. Truthfully, I was already a bit too old for Transformers. I suspect my desire for them came more out of peer pressure than anything else: I wanted them so I could continue playing with the kid next door, one of the few kids close to my age nearby, especially after my best friend had moved back to the east coast. I think, though, there’s more to it than my just being too old for the toy, or wanting it because the neighbor kid did. I think I was trying to hold on to my childhood for just a bit longer. Eleven or twelve is a weird age: one is outgrowing toys altogether, moving from the toy-playing of childhood into the confusing hellscape that is being a teenager. It’s a confusing time all-around, really: you’re on the cusp of junior high, you’re no longer seeing girls as your mortal enemy but have no idea why, you’re growing out of toys but still yearning for the joy that simple play brought you. 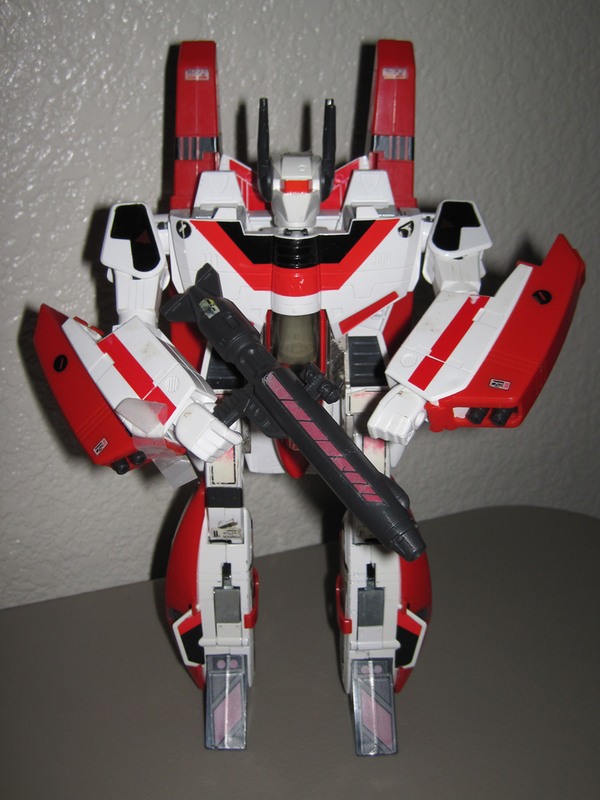 The biggest one I had was called Jetfire which, as the name implies, transforms from a jet plane into a robot. It was very cool, and one of the more expensive Transformers on the market at the time. My Parents refused to buy it for me. They figured that I was of an age that, if I wanted one of the most expensive Transformer toys out there, well, I could just save my allowance and buy the damn thing myself. So, stubborn little bugger that I was, I did. I saved my allowance for a few months, then went to the store and bought the toy. I was very excited about it. But, like the childhood that was rapidly slipping through my fingers, interest fell away before too long. I’d be entering junior high soon enough, and my interest in toys was waning while my knowledge that I was too old to be playing with them was growing. So I’d spent my hard-earned money on a toy that no longer held interest for me. Before placing them in the donations box, though, I took them out one more time. I transformed them from their robot forms to their vehicle forms and back. I took pictures. As an adult, I found myself fascinated by the engineering in them, the design. I’m just not the type who can look at a jet plane and conceptualize of how to make it turn into a robot; I marveled at the mechanics. I mean, c’mon, it had retractable landing gear. How cool is that? * Maybe. Then again, maybe I have been infected by the Black Oil and the entirety of this post is a cleverly designed ruse to obscure this fact. I’ll let you decide for yourselves. *** If anybody is a collector, email me and let’s work out a deal. **** None of which I’ve actually seen, but I think it’s pretty safe to assume that those three adjectives can be used to describe pretty much any Michael Bay film, no? That little playing may pay off. 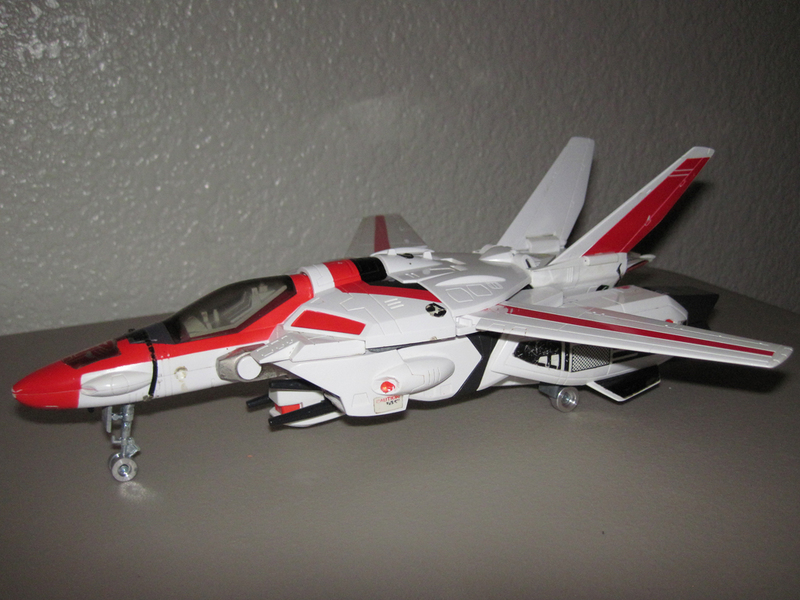 Jetfire looks to be in awesome condition! Hopefully you’ll find him a good home! Believe it or not, a reader has contacted me. His kid loves the Transformers, so were’ working it out now so they’ll have a good home. It’s fun to run into your childhood from time to time! I feel that way about My Little Ponies. 🙂 happiness…. Good luck! Don’t feel so bad … I got interested in them at the same time as you but, since I’m 10 years older than you, I was 21 or 22. I never bought one (I had college floormates who did) but I did watch the cartoon. The only money I shelled out for Transformers was seeing the first Transformers movie in the theater. And how badly did you want that money back when the movie was over? Can you really ever be too old for Transformers…? I didn’t think that was possible.